Back when I learned to drive—no, it wasn’t in the Model T—one of the things my father instilled in me was the need to track my vehicle’s gas mileage. Such information would alert me to problems before they became major issues, or so I remember hearing. For some reason, that particular lesson has stuck with me over the years, even as cars have evolved with systems that will find trouble spots long before they become obvious in a mileage book. So in every car I’ve owned, I’ve always kept a small notebook and pen. Every time I fill up, I pull out the notebook, and jot down the miles driven, gallons bought, and (usually) the cost per gallon. I then transfer these figures to a spreadsheet and track and calculate my miles per gallon over time. Have I ever actually done anything with this information? Not that I can recall… yet still, I diligently record every fuel purchase. Has a fast and easy-to-use data input screen. Supports more than one vehicle. Tracks per-tank and overall fuel mileage data. Can import and export data. Has a database of vehicles, to make setup quicker. Can use the vehicle’s trip meter or its odometer for mileage tracking. Generates useful reports based off the stored data. While no program successfully met every single criteria, two came quite close, while three others fell short in a number of areas. FuelCalc is the most limited of the five programs—it’s basically just a gas mileage calculator. You enter starting and ending odometer readings, and the amount and cost of fuel purchased, and FuelCalc will then calculate your mileage—stated as “Distance per amount purchased,” because the program doesn’t use units like liters or gallons—and “distance per cost of purchase.” FuelCalc doesn’t store any of your calculations, so it’s a use-it-when-you-need-it program. It works well enough, but it’s not really in the same category as the other programs in this list. MilesPerGallon does store records over time, but beyond that, it’s also quite limited. You can only track one vehicle, and the input screen doesn’t include a field for the date—each entry is stamped with the current date, so you must enter your data at the time of purchase, and you can’t enter old values that you may have kept on paper. There’s also no way to see the miles per gallon on just one tank, you can’t change the units (only miles and gallons are supported), there aren’t any statistics kept beyond miles per gallon, and there’s no way to export your data. You can see a graph of mileage over time, though, once you’ve entered enough data into the program. Gasmate can track mileage for more than one vehicle, but like MilesPerGallon, there’s no way to set the date for the values you’re entering—again forcing you to enter each purchase as it’s made, and preventing you from entering old values. In addition, you input the fuel quantity via a slider, making it nearly impossible to match exactly what you put in the tank. Gasmate doesn’t offer an export option, either, so this data will only exist on your iPhone. Finally, the only report the program provides is overall miles per gallon based on all the records you’ve entered for each vehicle. AccuFuel is a very capable program that’s incredibly easy to use, and contains just the features needed to input and track mileage. The program can track mileage for more than one vehicle, and displays each car on its own summary page—just like the iPhone’s Weather app, for instance. The summary pages display the mileage for each vehicle’s last tank and its overall average, as well as a mileage chart covering user-selectable time periods. These summary pages work quite well, and look as nice as anything Apple has done on the iPhone. When it’s time to input a new purchase, you select the proper vehicle’s summary page with a swipe of your finger, and then tap on the fuel pump icon to switch to the data input screen. Unlike the other mileage tracking applications, AccuFuel has an option to use your car’s trip odometer reading, instead of the full odometer reading, when you enter fuel purchases. A Brief History of Fuel Consumption: AccuFuel's summary page displays the mileage for each vehicle’s last tank, its overall average, and a mileage chart. 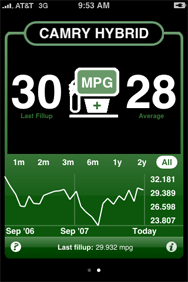 The main advantage of this method is that you only have to input (in most cars) three numbers instead of five or six—and in AccuFuel, the trip odometer value is entered in a text box via the numeric keypad; the full odometer is entered on spinning number wheels, as you see when setting a date and time in the iPhone’s calendar, for instance. AccuFuel’s input screen is set up for speedy data entry—there aren’t any fancy graphics, just text boxes (and the dials if you’re using the full odometer) and a numeric keypad. I found AccuFuel’s data entry screen to be the fastest of the bunch; I was able to enter approximately 85 records for our two vehicles in perhaps 30 to 45 minutes. Unlike Gasmate and MPG, you can set the date (just click on the date field), which makes it relatively easy to enter records from your paper mileage book. Unfortunately, there’s no import feature, but you can export your records via e-mail—they arrive as a list of comma-separated values on separate lines of text, ready to import into your favorite spreadsheet program. When you set up a new vehicle in AccuFuel, you choose your car from a large database of models and manufacturers. The program then pulls up the chosen car’s city and highway EPA mileage ratings, and you can specify how you’d like to calculate mileage (MPG in US and UK styles, km/liter, or liters/100km) and what units (gallons or liters) you use when filling the car. It doesn’t get much simpler than that. Overall, I found AccuFuel a very easy program to use. Its handling of multiple vehicles is intuitive and super simple, and its presentation of your mileage figures is by far the nicest of the four programs. A good data import tool and reporting that covers costs as well as mileage are the only two real shortcomings I found in my testing. At only $1, it’s a great value for the money. Car Care is the other strong candidate in this niche, and it’s the feature-count leader of the pack. Car Care goes beyond simply tracking mileage, as it also lets you track service work, and issues reminders on oil changes, and tire rotation and balancing. These reminders can be set up based on passing either mileage or time-based targets, for instance, every 8,000 miles or every six months. If a limit is passed, you’ll see a reminder alert when you launch the program. Two-Car Garage: Car Care supports multiple vehicles. Car Care supports multiple vehicles, and includes a database that makes for quicker setup. 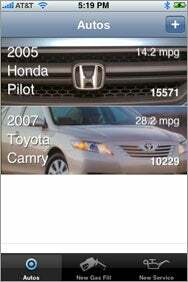 The database, however, doesn’t include the EPA mileage figures, as does AccuFuel. You can also assign a photo—a newly-taken one, or one from your iPhone’s collection—to each vehicle you add, which makes it easier to identify each vehicle in your virtual garage. The first screen you see when you open Car Care shows all your vehicles, displaying the photo, the car’s model and year, current odometer reading, and average mileage to date. Buttons at the bottom of the screen let you enter new fuel purchases or service work. While Car Care allows you to adjust the date of each transaction you enter, which would allow you to enter old records, the program also supports data import, which is a much nicer way to enter your existing data—and it’s the only program of those I tested that supports importing data. (You can also export your records via e-mail.) To import old records, you need to format them in a certain manner, as explained on the Car Care import page, and then paste them into a form on that page. After you submit and verify your data, you’re given a vehicle code and password. If you’re not importing data, however, the data entry screen in Car Care is somewhat time consuming to use. Gallons aren’t entered by tapping, but rather by spinning a small dial that shows increments in tenths of a gallon. Entering a 17-gallon fill-up for our truck required seven or eight finger flicks; I feel for those with 50-gallon long-range tanks! In addition, Car Care won’t let you use trip odometer readings, so you’ll have to enter the entire odometer reading—again using the spinning dials. On the positive side, you can input the grade of gasoline, which will help you track mileage by fuel grade. Although it’s a pain to use the spinning dials, data entry still doesn’t take all that long, and it’s not like—unless you live 150 miles from work each direction—you’ll be spending time on this page every day. Driver Data: Turn to Car Care for detailed reports on everything from mileage to your vehicle’s carbon footprint. 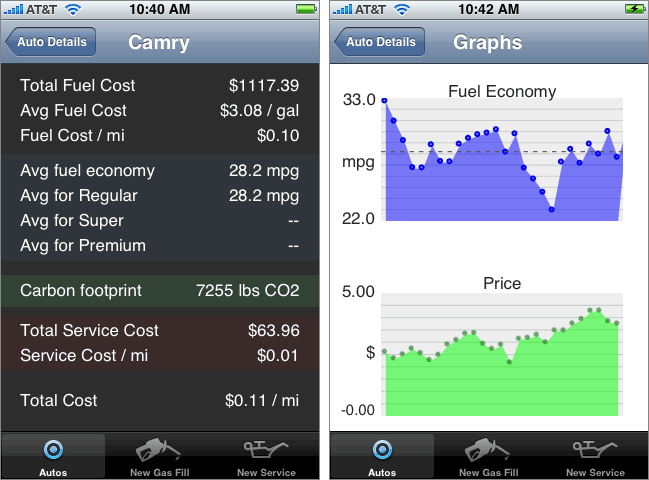 Car Care also creates detailed reports on mileage, gas costs, and even your vehicle’s carbon footprint, as seen in the image at right (click for a larger version). While the graphs look nice, they lack the detail seen in AccuFuel’s graph—there aren’t any time units on the X-axis, and you can’t change the displayed time period. The graph of fuel cost over time is interesting—and as of the last year or so, pretty depressing. I actually find the vehicle statistics page to be the more interesting page; that’s where you’ll find the gas-related costs, as well as an estimate of your vehicle’s actual cost per mile, fuel mileage by fuel grade, and total carbon footprint. The costs shown include information not only on fuel stops, but services as well. Car Care will let you enter services—such as oil changes, tire replacements, engine repairs, etc.—much like you enter fuel transactions, with the ability to assign a category to each service. If you choose the oil change category, you can even specify the weight of oil used. You can only assign one category per service entry, though, so if you had a number of things done, you’ll probably wind up using “Other” as the category. (Alternatively, you could enter separate transactions for each of the things that were done to the vehicle.) Any costs entered here will be included in the statistics page, reflected in both the service cost per mile and total cost per mile figures. Overall, I found Car Care to be easy and intuitive to use, although the time-consuming data entry screen is a bit frustrating—it’d be nice to have a text box and keypad for entering the gallons purchased at least, and the option to use the trip odometer instead of the full odometer. But these are minor points, given that you don’t spend much time on the data entry screen. So which one of these two fine mileage tracking products should you use? AccuFuel has the edge in input speed and presentation of data, but Car Care offers a ton of additional features, including financial reporting, service reminders, and mileage tracking by fuel grade. Whether you think those extra features are worth $4 over the cost of AccuFuel or not probably depends on how many existing records you want to transfer to your iPhone (no import with AccuFuel), and if you care about more than miles per gallon in terms of data analysis on the iPhone itself. You really can’t go wrong with either choice, though; they’re both solid programs that have convinced me it’s finally time to retire my fuel-tracking pen and notebooks. All programs reviewed are compatible with any iPhone or iPod touch running the iPhone 2.x software update.